First lady Kim Jung-sook will recite a Korean poem on a Chinese webcast platform Wednesday to support President Moon’s state visit to China. 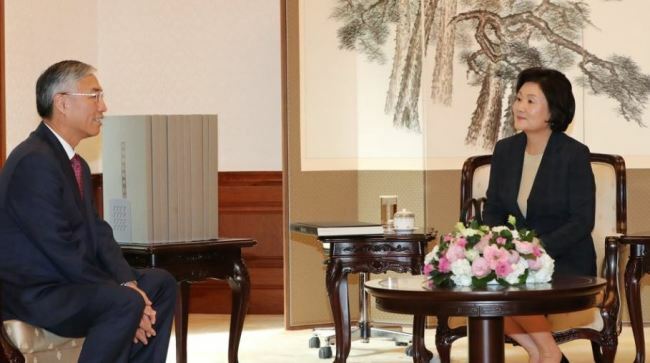 Cheong Wa Dae said Monday that Kim would read “Visitor” by Chong Hyon-jong on “The Poem for You,” a China-based media platform that promotes poetry as a tool for communication. Kim’s reading will be aired on the platform at 10 p.m. local time, which will also be shared across Chinese social media outlets. According to Cheong Wa Dae, Kim chose Chong’s work for its special message on the preciousness of new encounters and resulting relationships, a subtle allusion to the prospect of Korea-China relationship. Following Wednesday’s reading by Kim, a series of Korean poetry will be aired on “The Poem for You,” every night till Sunday, featuring professional Go player Lee Chang-ho, actress Choo Ja-hyun and more as the readers. Prominent public figures like Margrethe II the Queen of Denmark, conductor Zubin Mehta and Chinese first lady Peng Liyuan have previously appeared on the program.